Sergiev Posad is situated about 75 km northeast of Moscow. 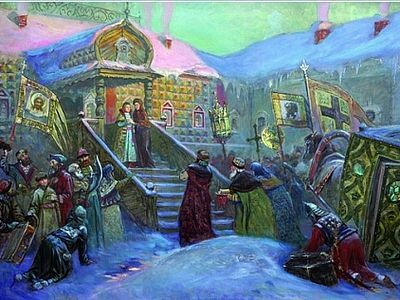 The town grew in the 15th century around one of the greatest of Russian monasteries, the Trinity Lavra established by St. Sergius of Radonezh, today is one of the largest monasteries in Russia. Sergiev Posad also has a long history of toy-making and is considered to be the capital of the toy kingdom. The Russian matryoshka known all over the world was born here. It seems only fitting that the town should claim to its fame a tiny museum, one which is home to a collection of rare toys, some of which date back to Imperial Russia and the last Russian Imperial family. The Art and Pedagogical Toy Museum is a unique repository of historic treasures, founded in Moscow in 1918 by artist, collector, museum activist Nikolai Dmitrievich Bartram (1873-1931). With 100,000 items, the museum boasts one of the largest and most unique collections of toys in Russia. The pride of the museum is a collection of toys of the five children of the last Russian emperor Nicholas ii, which miraculously survived revolution and war. Among these are a collection of porcelain dolls, once owned by the grand duchesses Olga, Tatiana, Maria and Anastasia. Many of these works of art were specially made by Western European and Russian firms abroad for Their Imperial Highnesses in the early twentieth century. 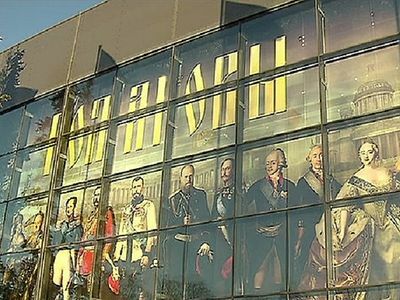 In 2000, the State Historical Museum in Moscow hosted an exhibition of some 400 items, including the toys of the children of Emperor Nicholas II from the collections of the Toy Museum in Sergiev Posad. They produced a magnificently illustrated exhibition catalogue (photo above left). The 144-page catalogue (published in Russian) featured more than 200 colour and black-and-white photographs of the exhibits, which included the children’s toys, dolls, books and games as well as their clothes (the grand duchesses dresses and the tsesarevich Alexei’s uniforms), and other personal items such as porcelain, furniture, letters, drawings and paintings made by the children, portraits, photographs and more. The exhibition ran from December 29, 2000 - March 31, 2001. Shortly after the close of the exhibition I was able to import a quantity of these catalogues and offered for sale in the Royal Russia Bookshop. This title is now long out-of-print, yet still highly sought after by Romanovphiles. In June 2011, the Alexander Palace at Tsarskoye Selo hosted the exhibition In the Children's Rooms of the Alexander Palace. Set out in the former rooms of the last tsar's children on the second floor of the Alexander Palace, the exhibition featured over 200 items, including toys, dolls, puppets, and other personal items belonging to Nicholas II’s children, many of them on loan from the Toy Museum in Sergiev Posad. A small 36-page catalogue (published in Russian) was also producted (photo above right). Sergiev Posad is an easy day trip from Moscow. The Toy Museum is situated at pr. Krasnoy Armii, 123, a short walk from the monastery. 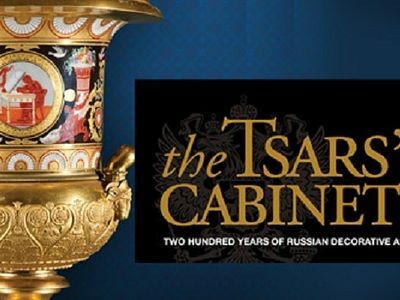 The much-anticipated, travelling exhibition, The Tsars’ Cabinet: Two Hundred Years of Russian Decorative Arts Under the Romanovs open on October 11th at the Museum of Art in Huntsville, Alabama.